Today is transfer deadline day. This is the first time that a transfer window has been enforced so early in the Conference and Football League, however both the Conference and the Football League are still believed to be in dialogue with FIFA hoping for leeway with loan transfers. News of any confirmed Conference transfers will appear here. Alex Inglethorpe has won the Conference National Manager Of The Month award for August. The Exeter City manager led his side to four wins and a draw during the month. Steve Burr of Northwich won the Conference North award, and John Rains of Sutton Utd won the Conference South award. Ahead of tomorrow's transfer deadline Aldershot boss Terry Brown has released two more players, including former Bulls midfielder Bertrand Cozic, and transfer listed a third despite only naming 15 fit players for Mondays defeat against Grays. Another ex-Bull, John Brough, is one of eight injured players Brown is hoping will be fit for Monday's televised home game against Crawley. In other news, former Hereford striker John Grant has extended his contract at Halifax until the end of the season. Grant, 24, has scored 2 goals in 11 starts since arriving at The Shay on a short term deal in March. TheFA.com confirmed today that Ryan Green has received a three match ban for his sending off against Tamworth on Saturday. The ban will take effect from this Saturday with the visit of Altrincham, and also include the trickier matches against Stevenage and Morecambe. The Bulls News Team would like to announce that this afternoon it has handed editorial control of the Bulls News site over to the Forum Admin of the Independent HUFC Forum (www.hufcforum.co.uk). Both the Independent HUFC Forum and Bulls News were originally derived from the much missed HU-FC website, which covered Hereford United for over five years. http://bullsnews.blogspot.com/ but the email contact will now be the same as the Forum - hufcforum@hotmail.com. The new editors have already secured Brian Goodwin's excellent match reports, and are happy to hear from new contributors. Over the past 16 months Bulls News has tried to bring readers news and views from Edgar Street. We beleive that we have provided a site where visitors can catch up with all that has been happening without having to trawl the internet. This takes a lot of time, but the response we have had from visitors to the site has made the task very rewarding. However, changed circumstances are likely to mean that we will not be able to keep the site as up to date as we would like. We therefore feel it is better to close now than see the site decline. There are many people and organisations that have helped us over the past 16 months. We thank them all. Bulls News has decided to close. Tony James, the Hereford United captain, may want to forget his 300th appearance for the Bulls this afternoon. He was responsible for allowing Grays to score their first goal when he tried to dribble the ball out of danger but was dispossessed. It was a similar mistake by James that let Cambridge score their first goal last Tuesday week. Everyone is human and everyone makes mistakes, but James has cost the Bulls two goals out of the four scored against them this season so far. The management decided to leave James on the pitch, probably to try and rebuild his confidence, until the 71st minute when he was subbed. The sarcastic cheers from sections of the crowd as he left the field will not have helped matters. A player with 300 games for the Bulls deserved better. Graham Turner and John Trewick have a difficult decision to make about James. If he is put on the bench for Monday's game it could dent his confidence further. To drop a player after a poor performance is not always easy, to drop the captain will be even harder. The management will need to think whether a reshuffle at the back after just four games would improve matters. In general, Mkandawire, James and Beckwith look fairly solid and are getting used to playing with each other. As regards taking the captain's arm band away from James, that too would dent his confidence. But, on the other hand, a captain should lead by example and James could be said to be failing to do that at present. Not only have he made mistakes which have led to goals but his distribution has been sub-standard recently. Graham Turner has been very loyal to Tony James, especially after James seemed to be thinking of a move away from Hereford last season. He will probably keep James as captain on Monday, but will expect better things from a player who is unlikely to be at Edgar Street next season. Hereford United put in a poor performance at Edgar Street this afternoon and fell to their second defeat of the season. Newly promoted Grays Athletic looked a dangerous outfit that should do well in this league. However, they did not have to work too hard to gain victory today. Manager Graham Turner kept the faith in the same side that defeated Crawley Town a week ago with Rob Purdie keeping his place in the middle of the park. The only change was on the bench where Darren Blewitt failed to recover from a foot injury and so Graham Evans took his place. Andy Ferrell was on the bench again; it is thought that he did not play today because Turner wants him to start against Tamworth, who will be a more physical side than Grays. Hereford started brightly and were in control for the first quarter of an hour before disaster struck once again for Tony James. Jon Brady had fired an early shot over the bar before Guy Ipoua set up his strike partner Adam Stansfield with a ball in behind the defence, but Stansfield hit the side netting. With fifteen minutes on the clock, Craig Mawson rolled the ball out to skipper James, who had been impressive until then, in the Hereford defence, and James was quickly closed down. Instead of clearing the ball to safety, or knocking it to Dean Beckwith who had given James an option to his left, he attempted to dribble the ball out of defence. He was soon tackled and Tony Battersby made no mistake in smashing the ball into the bottom corner beyond the reach of Mawson. This is not the first time that James has stupidly lost the ball in defence this season, leading to a goal for the opposition. It was down hill for Hereford from then on, as heads dropped and Grays got a foot hold in the game. Chances were few and far between for the remainder of the half; Dennis Oli saw a shot after a Gray's break saved by Mawson while Ipoua's header from Ryan Green's cross was no trouble for Ashley Bayes in the visitors goal. On the stroke of half time Brady came close again with a free kick that was not too far away from the intended top corner. A far more eventful second period started with Stuart Thurgood curling an effort just wide. Brady was close yet again to equalising soon after; his half volley was just inches over the cross bar from twenty yards. John Nutter's left footed free kick on the flank bypassed everyone in the Hereford box although Gary Hooper almost connected with a header at the far post. Rob Purdie spread play to Green on the right and the Welshman burst towards the box was ended as he was fouled twenty yards out. Alex Jeannin's free kick hit the wall though and a Gray's break away ended with man of the match Dean Beckwith heading a dangerous cross behind. Craig Stanley replaced the injured Rob Purdie with a hour gone. Stansfield headed Jeannin's free kick goal bound but once again Bayes wasn't troubled, while at the other end a misunderstanding between James and Beckwith resulted in a good recovering challenge from the latter. This may have been the final straw for Turner and within minutes he replaced his captain, James, with Danny Carey-Bertram as The Bulls reverted to a 4-4-2 formation with Carey-Bertram on the left wing. Green kept the score at 1-0 when he cleared a header off the line following a corner before John Martin hit the post from close range, when he really should have doubled the visitors advantage. United broke quickly but Carey-Bertram's cross was cleared, triggering a counter attack for Athletic. Substitute Jamie Slabber beat the offside trap and had a clear run on goal, but shot wide with Tamika Mkandawire putting in a last ditch tackle to put him off. Hereford had their best spell of the game after this with some good chances to level things up, but thanks to Bayes they failed to do so. Brady's corner was knocked on before Mkandawire's shot was blocked. It fell to Stansfield and his shot was blocked too before Beckwith volleyed over. At the other end a double goal line clearance by Green saved United further embarresment before Hereford felt sure they should have had a penalty. A shot by Carey-Bertram, after Stanley's free kick, hit the arm of a defender but the referee dismissed appeals. After hitting the defenders hand, the ball fell back to Stanley, who saw his drive go out for a corner. Mkandawire came close with a low left footed drive from twenty five yards, that almost caught Bayes unaware. However, the ex-Woking stopper scrambled across his line to push it out for a corner. Carey-Bertram then went close at the game came to an end after some good, patient, build-up play, when Stansfield knocked a short ball to him in the box but once again Bayes tipped the ball wide. Hereford failed to make use of the five added minutes at the end and were punished right at the end. Martin had hit the side netting already before a cross in from the right was tapped in from close range by Hooper much to the delight of the 57 away fans. A fair number of the home fans in a crowd of 2,997, rose to their feet and left the stadium before the end of the game. All in all, this was a poor performance by Hereford and they will definatly not be able to afford many more of that sort if they are to meet their ambition of automatic promotion this season. There were far too many players on the pitch today who, for one reason or another, did not seem to put the effort required in. Although short term memories of this result may be forgotten with a win at Tamworth on Monday, it may prove more costly come the end of the season. HUFC Team: Mawson, Mkandawire, James, Beckwith, Jeannin, Green, Coldicott, Purdie, Brady, Stansfield, Ipoua. Subs: Brown, Stanley, Ferrell, Carey-Bertram, Evans. GAFC: Bayes, Bruce, Stuart, Mawer, Nutter, Hooper, Thurgood, Martin, Poole, Oli, Battersby. Subs: Brennan, Matthews, Kightly, Ayres, Slabber. It can't be the easiest of tasks having to go on the radio after a defeat, but Jon Brady was brave enough to be interviewed by Keith Hall for BBC Hereford and Worcester. He admitted that the performance by Hereford United this afternoon was totally unacceptable. "I think we were too nice today," said Brady who had a relatively good game. "We let ourselves down, it's not good enough for Hereford. We've got ambitions, we'll rally ourselves, play as a team and really work hard for one and other." "With the bunch of lads we've got here we know we can do that. We got to put in a good performance on Monday." The game on Monday is away at Tamworth. They lost today at Stevenage. Hereford United were outplayed by a young Grays Athletic side this afternoon at Edgar Street. Errors in defence which led to a goal in each half cost the Bulls the game. Tony James, the Hereford United captain, was subbed in the second half after which the Bulls did come back into the game but the result was seldom in doubt. BBC Hereford and Worcester are to cover the Tamworth away game next Monday. There will be live coverage of the second half on 94.7FM. Keith Hall will be the commentator. However BBC Hereford and Worcester are unable to provide internet coverage for this game. Meanwhile the Bulls have dropped to third in the Conference this evening. York City move above them as they defeated Woking 2-1 in tonights only Conference game. Quoted on soccer 365, Grays Athletic manager Mark Stimson hopes to be able to pick from a fully fit squad for tomorrow's game against Hereford United. "We have no injuries or suspensions and I hope it stays that way. This is a big test for us and the sort of game we were playing to try and get all last season." 20-year-old striker Jamie Slabber may get a game after coming off the bench to help Grays fight back for a point against York last Saturday. Meanwhile Graham Turner, the Hereford United manager, has spoken to BBC Hereford and Worcester about Grays Athletic. "The reports we have had about Grays are very complimentary, the way they play. They have stuck six past Gravesend, so we know it will be difficult. Turner thought both teams would try to get the ball down and pass it. "It should mean an open game." The decision by the Official Hereford United website to promote totalbet.com means that any odds quoted by the site may not be the best ones available to supporters. For example the site states that Hereford United are 7-2 to win the Conference with totalbet. However a closer look at odds available suggest that that price isn't the best available this afternoon. Sportingbet, who are linked to the Bulls, are quoting 4-1 against Hereford. Other bookies offering 4-1 include Stan James, William Hill and SportingOdds. It appears a strange decision by the club to support totalbet when Sportingbet was set-up by well-known Hereford United supporter and benefactor Mark Blandford. The former Hereford United player has moved to Whaddon Road for a month as cover for Craig Johnson, who is injured. "It's been frustrating so far this season and I have spoken to the gaffer (Gary Johnson) about it," said Rose. "We agreed it would be good for me to go out on loan and play some games. "I understand why I haven't been playing because the gaffer brought in Nathan Jones as an experienced left-back and he's done well. "But it's an unusual situation for me because I've played regularly for both Yeovil and Hereford over the last few seasons. I've got to make sure I do well at Cheltenham and then wait for a chance to prove what I can do to Gary Johnson. "I've spoken to John Ward and he's told me what his plans are. I can't expect to go to a new club and be playing straightaway but if I'm in the team I'll be delighted. "As a footballer you just want to be playing in competitive games and I've only been in the reserves so far this season. So if I am playing on Saturday I've got to make sure I do well and keep my place." Hereford United entertain Grays Athletic tomorrow at Edgar Street in what is beleived to be the first meeting between the two clubs. The Bulls, who are now in second place in the Conference, will be hoping for a repeat of the home form which saw them put four goals past Scarborough two weeks ago. However Grays Athletic started the season off by putting six goals past Gravesend, so hopefully there will be some goals to be seen at the game. Since those first games, both sides have had set-backs. The Bulls lost at Cambridge, but won last Saturday at Crawley, whereas Grays have drawn their last two games. Graham Turner will have at least 18 of his 21 strong squad available. Long term injuries to Jamie Pitman and Simon Travis will keep them out although Pitman is close to being fully fit. Loan signing Darren Blewitt could be in contention although he may have a late fitness test on his foot which was x-rayed earlier this week. Turner is expected to keep to the same format as in the previous three games although as he told BBC Hereford and Worcester yesterday, it is taking time to bed in. "With so many new faces in the side, it will take a little bit of time for it all to gel. There are occasions when there is a little bit of misunderstanding between players. "The shape of the side is different from last season when we played 4-4-2. We've playing with the free player behind the front two strikers. "The system is not working as smoothly as we would like, but it's comimg on. "We could always revert back to the other system if we need to, but right at the moment I'm prepared to stick with it and hope it works. "When you look at the results so far, the goals we've scored, the chances we've created, two clean sheets as well, it's not going bad at all." Grays Athletic are managed by 36 year old Mark Stimson, who had a playing career with over 240 league appearances at Tottenham, Newcastle, Portsmouth, Southend and Leyton Orient. However several of the players will perhaps be better known to Hereford United supporters. Aaron McLean was with Aldershot when Hereford met them in the Conference play-offs in 2004. Described as a pacy 21-year-old striker McLean was with Leyton Orient initially and came to Grays on loan during 2002 before moving on to Aldershot Town in the Conference before being released by Shots manager Terry Brown and rejoining Grays. McLean didn't feature for Grays last Saturday. Dean Brennan was with Stevenage, so should be well known to Jon Brady. He signed a two yeay deal with Grays in August 2004. And the BBC have picked out Gray's Stuart Thurgood as one to watch. The midfielder started almost 50 games for Southend before dropping out of the Football League but has time to make it back. Still only 24, Thurgood captained Grays to the Conference South and FA Trophy double last season. "Should be interesting. They're a side that goes forward and tries to score lots of goals, it's the kind of game we enjoy ourselves. We like a big open game." BBC Radio Essex will have commentary on the game. Former Hereford United defender Michael Rose has been loaned out by Yeovil and has joined up with Steve Guinan at Whaddon Road. Rose, who appeared five times for the England National Game XI has failed to make the left back position at Yeovil his own this season and after Cheltenham lost Chris Armstrong to injury, John Ward signed Rose on a one months loan. "I'm delighted that Michael will be joining us for a month" Ward told the Official Cheltenham Website. "I could cover for Craig Armstrong's absence with our own people but Michael will give us a round peg in a round hole because he's naturally left-sided. "We know of Michael's quality and I'm really pleased we've been able to bring in someone of his calibre." In his weekly column in today's Hereford Times, Graham Turner comments on how to play the game in the Conference. "You either knock it long and run after it, which I understand Exeter, who have gone top of the league are doing. They have not strung two passes together yet - I have spoken to a number of people, in particular Stuart Watkiss at Kidderminster who played against them last week. From what he told me they had to sedate the ball at half time, it was battered so much! "We want to get the ball down and pass it with a purpose. When we deviate from that pattern we look a poor side, but it needs 10 out-field players clued in to being available to receive the ball. "It is obviously a more difficult way to play than just kicking the ball forward but also more pleasing on the eye and it can create a lot more chances. "But with so many new faces in the side it will take a little time to get that understanding." Hereford United have extended their range of fitness equipment after being presented with two brand new bikes from Climb on Bikes, reports the Hereford Times. It is thought that the bikes will help the rehabillitation of injured players. Tony James and Stacey Coldicott were photographed alongside United's physio Wayne Jones and Climb on Bikes owner Clive Beacon. Loan signing from West Ham, Darren Blewitt, is the only doubt for this Saturday's game with Grays Athletic other than long term absentees Jamie Pitman and Simon Travis. Hereford United manager, Graham Turner, told the Hereford Times, that Blewitt had been struggling with a foot injury and has had an x-ray. Turner hopes he will be fit enough for the weekend's two matches. Commenting on Grays, Turner said they had been watched. "The reports we have had about Grays are very complimentary. We had them watched against Gravesend and again against York and it sounds as if they are a side who likes to play football." HUISA, the Hereford United independent supporters association holds its annual general meeting next Saturday. The AGM takes place at the Richmond Club, across the A49 road from Edgar Street, with a 12 noon start. HUISA is one of the largest individual share-holders in Hereford United but is probably most thought of as the organisers of the official coaches to away games. However they also sponsor both John Trewick and Jon Brady. The association is always looking for new members and would also like to remind those members, who haven't renewed yet, that subscriptions are now due. Hereford United reserves defeated Kidderminster Harriers 7-0 yesterday. Daniel Carey-Bertram scored five of the goals in the one-sided game. Wayne Jones, the Hereford United physio who is sponsored by Bulls News, told the Official Website that Jamie Pitman played his first game for the Bulls since being injured. Meanwhile Grays Athletic are expected to bring about 100 supporters to Edgar Street on Saturday for the first meeting of the two clubs. Swansea City are to hold a press conference this morning at which it could be announced that Gavin Williams is to join the club on-loan for the season. Former Hereford United player, Williams moved to West Ham last season from Yeovil for a reported £250,000 but has been unable to get in the first team on a regular basis. Swansea chairman, Hugh Jenkins, has admitted that they would like to sign Williams. "We will keep pursuing it. Gavin wants to come to us and we want to sign him. The only stumbling block is Alan Pardew. "He has said the player can go out on loan somewhere, but he has made it known to us that he would like him to play for a Championship side. "A lot of Premiership sides think like that - they want to see what the players might be able to do for them in the future. It's a similar case to the one we had with Darren Pratley and Fulham. "We think West Ham are going to make a final decision this week and, until he signs for someone else, nothing will be dead and buried as far as we're concerned." Hereford United are to play Walsall this week behind closed doors. Its come about because the Saddlers want to look at Spanish goalkeeper Rafael Gonzalez Robles. The former Real Oviedo keeper has been on trial with Saddlers for the last two weeks and will be hoping impress further according to the Express and Star. Walsall manager Paul Merson has arranged the private clash with Conference outfit Hereford to give Rafael the chance to shine again after he caught the eye with some smart saves against Redditch last week. Saddlers had been hoping to run the rule over the former Spain under-23s man in this week's opening reserves match of the season at Sheffield Wednesday, but a lack of international clearance prevented him from playing. New rules prevent foreign players gaining clearance until they sign for a new club, and without it rules prevent them playing in Pontin's League action. Merson is keen to recruit another goalkeeper before the closure of the August transfer window, with inexperienced teenager Dean Coleman currently the only backup for No 1 Andy Oakes. Former Hereford United stopper, Ben Scott, recently had a trial at Walsall. Meanwhile Bulls manager Graham Turner could use the match to allow those in his 21 man squad who haven't played any or much Conference football to have a game. The odds on Guy Ipoua being top goalscorer in the Conference have halved in under two weeks. The Hereford United striker, who came to Edgar Street from Doncaster, has already scored three goals in three games. At the start of the season he could be found at 20-1, but now the best price is 10-1. This can be found at both Skybet and Bet 365. Anthony Elding is also at 10-1 with Skybet. The Stevenage striker has scored twice so far. Favourite with Skybet is Lee Boylan of Canvey Island at 8-1, whilst Bet 365 have both Charlie MacDonald of Gravesend and Elding as their favourites at 7-1. As regards the Conference title, only Stan James offers odds at 9-2 against Hereford United. Most others put the Bulls in the range 3-1 to 4-1. Exeter are now second favourites at around 5-1. At least the bookies think Hereford are safe from relegation. If the Bulls were to drop punters could get £125 back for a one pound stake with Bet 365. The Hereford United under 18's play in the South West Conference this season. Unfortunately they didn't get off to the best of starts when they were well beaten by Swansea on the opening day. Last Saturday they were at home to Yeovil and lost 3-1. List of fixture (liable to change).All matches start at 11am. After an 18-month absence from the terraces, the Independent Hereford United Supporters Magazine, "Talking Bull" will be back on sale from around 1:30 pm this coming Saturday, as the Bulls entertain Grays Athletic at Edgar Street. Selling at just £1, the fanzine is written by the fans - for the fans - and, as always, the new issue is a mixture of features, interviews, quizzes, plus the usual banter and extreme opinions - both positive and negative. It's what being a Hereford United fan is all about! This season marks the 16th anniversary of the magazine, which was first published as a simple eight page typed, black-and-white edition way back in September 1989. The aim today is exactly as it was in the days of Ian Bowyer, Chris Hemming, and Jon Narbett, with the first ever editorial by Chris Jones and Keith Benjamin insisting "Talking Bull will fill a gap in the lives of Hereford United fans everywhere, and will provide an alternative and witty look at the great game of football. We will take a critical look at the state of football in general, and at Edgar Street in particular." This season, the fanzine's 44-pages are crammed full of articles, information and letters on a variety of subjects, and thanks to an affiliation with The Football Supporters' Federation, includes the latest information on football campaigns. The fanzine is produced entirely voluntarily, and all profits are received by Hereford United - primarily in the form of player, match and match ball sponsorships, but also through ground advertising and donations. Supporters are urged to get their hands on a copy early this season, as with crowds topping the 3,300 mark, this the 90th issue of the fanzine, is likely to sell out. If there are any copies remaining after Saturday they will go on sale at Tamworth on Bank-Holiday Monday. To avoid missing out a subscription service is available to fans across the UK at just £11 for 8 issues, which includes postage. Bulls News would like to thank Keith Hall for his help with this article. The away game against Tamworth on Bank Holiday Monday, August 29th is not all ticket despite rumours to the contary. However if any Hereford United supporter would like a seat, apply before Thursday. There will only be a limited number of seats available for visiting fans, we have already received postal applications from some Hereford fans and have sent them their tickets. to the away terrace will be payable on the day. Crawley Town has told Bulls News this morning that there were 351 Hereford supporters counted last Saturday. In addition a few sat in the stands, making a total of about 360. Next Saturday will be the first time Grays Athletic have visited Edgar Street for any fixture let alone a Conference game. The Essex side come to Hereford as current top goalscorers in the league and with just one point less than the Bulls. They put six goals past Gravesend in their first game this season although were held to a 1-1 draw by York City last Saturday. Grays Athletic had to wait 115 years to reach the top flight of non-league football, but when the Club did make the grade, it did so in style. In May 2005, the Club completed a remarkable double of league and FA Trophy success in a season of firsts. Grays clinched promotion to the Football Conference, becoming the first club to win the newly-inaugurated Conference South league, wrapping up the title by the end of March, scoring 118 goals in the process. Then, having claimed the scalps of Conference sides Exeter City and Burton Albion on the way, Grays faced Conference North side Hucknall Town in the FA Trophy final at Villa Park. A closely-contested game watched by over 8,000 fans went to extra time and then penalties, where 'keeper Ashley Bayes was the hero saving from Russell Cooke to claim the biggest knockout prize in non-league football. Grays were the first Club outside of the Football Conference to achieve this league and FA Trophy double. Elsewhere Grays produced their first non-league internationals, with captain Stuart Thurgood playing two games for Paul Fairclough's England National Game XI and teammates Mitchell Cole and Dennis Oli also getting callups. It will cost an extra pound to watch Hereford United next Saturday. These prices equate to £8.50 per game for an adult and only £4.75 for a concession. There are even better deals for families in the stands. For example, an adult plus three children can buy tickets for £367. This equates to just over £18 per game or less than £8 for the adult and about £3.50 for the children (under 16). Some of the details for the LDV Cup have been announced. Forty-eight League One and League Two clubs will be "putting out a strong side" whilst twelve Conference clubs will pretend they have a strong side to put out. The plucky Non-leaguers are: Accrington Stanley, Aldershot Town, Cambridge United, Crawley Town, Dagenham & Redbridge, Exeter City, Halifax Town, Bottlers Bulls******* Hereford United, Kidderminster Harriers, Morecambe, Farnborough Town's Arsenal Windfall Stevenage Borough and Woking. The draw for the first round will be made on September 17th during Soccer AM on Sky. Although only three games have yet been played, Hereford United are top of the Conference disclipline league. To date the Bulls have only been penalised for 27 fouls, whereas Aldershot have 58 credited to them. After winning the fair-play league last season, it was thought that by bringing in couple of 'harder' players in mid-field the Bulls would run the risk of a few more fouls. Time will tell. Hereford also top the card count with just three yellows so far. At the other end Graham Westley's Stevenage have seven yellow's and one red to their name as have Woking. Guy Ipoua, with three goals, is joint top scorer in the Conference. Crawley Town manager, Francis Vines, spoke to the Non-League Paper after yesterday's game with Hereford United. "Hereford are fancied to win the league and like to play football, which is to be applauded, but in the first half at least we showed them how it is done. "We just can't score at the moment. We had a couple of fanastic chances. "Hereford's first goal was definitely defendable - we could have cut out the cross while for the second, Phil Smith said one guy had his arm across him preventing him from punching the ball. "I don't like to say it but the ref didn't give us a great deal." It was Hereford's first away game in their new strip. It is already been likened to that of Brazil, with its yellow top and blue shorts. Hereford United came away from The Broadfield Stadium with an eventually comfortable 2-0 victory against Crawley Town. A generally poor first half lacked any real skill from either side, as the long ball tactic was adopted by both providing a frustrating spectacle. Graham Turner made one change from the side that has started the last two games with Rob Purdie being promoted from the bench, swapping places with Andy Ferrell. Otherwise, The Bulls were unchanged. Hereford started well and created an early opening after a good run to the corner by Adam Stansfield, who crossed to the far post where Ryan Green layed the ball on to Jon Brady, but his effort was drilled over the bar. Stansfield tested 'keeper Phil Smith with a shot on the turn but Smith gathered easily before Richard Hodgson was booked for the hosts. Jamie Cade went close to opening the scoring for Crawley after a free kick from the left led to a scramble in the box before Cade forced it wide with the goal gaping. Stansfield supplied his strike partner with a ball through on goal but Ipoua was forced wide by Smith but, having rounded the goalkeeper, had to cut back as he fired a tame effort wide. Ipoua then danced his way between two defenders and saw his effort deflected safely into the 'keepers arms while, at the other end, Steve Burton smashed a twenty five yard effort towards goal that needed the fingertips of Craig Mawson to push it over the bar. Burton then was gifted a chance to put the home side in front but was denied by the post after Stacy Coldicott was disspossesed and the ball was flicked through to Burton. Brady attempted an overhead kick from Stansfield's cross after Tamika Mkandawire had found the attacker, but it was off target as the half came to a close. The game had faded towards the end of the first half and it also lacked incident until Hereford opened the scoring after fifty eight minutes. On one of the few occasions that The Bulls actually managed to get the ball on the ground and put together a series of passes, they tore Crawley apart and took the lead. Coldicott provided the defining pass after United had broke down the right, finding the run of Green in behind the defence and he slid the ball across the face of goal to give Ipoua the simple task of firing Hereford into the lead. Brady then had a great chance to double the advantage but his bullet header at the near post, from Ipoua's cross, was the wrong side of the post. Craig Stanley was introduced in place of Coldicott with twenty minutes to go while ex-Bulls Danny Davidson came on for Crawley. Brady's free kick caused all sorts of problems in the home sides penalty area with two crucial blocks keeping the scoreline down before a break saw a good chance for Burton, but he smashed his volley wide. First half sub, Stuart Douglas, shot on the turn but it was wide before Davidson almost equalised from the edge of the box. His low shot came off the foot of Tony James and totally wrong footed 'keeper Mawson. However, he managed to readjust quickly and throw himself down to tip the ball around the post for a corner. He then had to be alert as the corner dropped in the danger-zone and he was quickly down once again to claim. Purdie fired over the bar from twenty yards after man of the match Stansfield had past two defenders and cut back for him before Danny Carey-Bertram replaced Ipoua. The sub was involved in the build up to the second goal for Hereford, as he won them a corner on the right in the eighty third minute. Smith made a mess of clearing Alex Jeannin's corner and the ball fell into the path of Mkandawire who fired into the roof of the net for 2-0. Stansfield was blantantly brought down as United broke late on and Ian Simpemba saw yellow for this act. The resulting free kick, in injury time, was worked down the right where Stansfield eventually crossed for Jeannin but he fired wide at the far post. Although the eventual outcome was reasonably comfortable for Hereford, there were stages in the game where the tactics appeared to be all wrong and it was difficult to see where a goal would come from. However, when decided to get the ball down it paid off. The first time they did this in the second half resulted in the opening goal. The overall performance was not the best, but the 300 or so travelling supporters in a crowd of 1,842 will be more than happy with the result. HUFC Team: Mawson, Mkandawire, James, Beckwith, Jeannin, Green, Coldicott, Purdie, Brady, Stansfield, Ipoua. Subs: Blewitt, Brown, Ferrell, Stanley, Carey-Bertram. CTFC: Smith, Judge, Simpemba, Hodgson, Elam, Wormwull, Cade, Blackburn, Woozley, Jenkins, Burton. Subs: Ward, Opinel, Douglas, Davidson, Brown. Tony James, the Hereford United captain was interviewed by Keith Hall for BBC Hereford and Worcester after this afternoon's game at Crawley. "It's been a difficult game. I think they only lost two games all season at home so we're glad to get three points. "We've got some good defenders here now. We're getting to know each other a lot better. We're all strong players. We've just got to work a bit more as a team. "It should pay off for us, it can only get better. Reviewing the game James thought that his side had started very brightly and passed the ball well. "But then we dropped off a bit and most of their efforts at goal were probably from our own mistakes. "Second half we defended really well and did our job." The interview turned to Ipoua who has scored three in three games and Jeannin. "Guy Ipoua is on fire now. He can be frustrating at times but as long as he keeps scoring we won't mind that. "Alex, great delivery from corners. We're not the biggest of teams, but delivery helps and if it's a good ball you have a chance of scoring." HUFC: Mawson, Green, Jeannin, Mkandawire, James, Beckwith, Coldicott, Purdie, Brady, Stansfield, Ipoua. Guy Ipoua scored his third goal in as many games in the 57th minute to give United the lead by a goal to nil. Tamika Mkandawire then doubled United's lead scoring, after the Crawley keeper lost the ball after a Jeannin corner. The attendance at Crawley today was 1842, with around 250 supporters from Hereford. A full report will be on later. Bulls News recently came across this potted history of Hereford United. Article taken from Wikipedia, the free encyclopedia, although it was probably adapted from Ron Parrot's Hereford United book. Hereford United F.C. are a football team from Hereford, currently playing in England's Conference National. The geographical location of Hereford and a lack of local interest meant a senior football team was formed comparitavely late when Hereford United were founded in 1924. An amalgamation of two local clubs - St. Martins and RAOC - meant the first semi-professional football side in the county. They were to play in the Birmingham Combination and ground-share the Edgar Street stadium with Hereford City, the leading amateurs in the town. United played their first ever match against Atherstone United, losing 3-2, and soon after they played their first ever FA Cup game - against Kidderminster Harriers - losing 7-2 in an extra preliminary round. By 1932, Hereford were playing in the FA Cup first round but lost in a replay to Accrington Stanley, one of the former greats of English football. United progressed through the local leagues and into the Southern League by the outbreak of World War II in 1939. The Southern League provided the club with much interest in the non-league game and as time progressed, the Bulls became known as one of the top teams outside of the Football League. For twenty one successive seasons, United reached the first round of the FA Cup until election to the Football League, and constantly reminded the Football League of their potential. The FA Cup provided highlights in the early years, an 11-0 win over Thynnes and a 18,000 crowd to watch Sheffield Wednesday defeat United 3-0 in 1958 were highlights. John Charles, the Leeds, Juventus and Wales legend took over as player/manager in the late 1960's and led the club to great things in the league, but it was his successor who achieved the ultimate aim. BBC Television followed Hereford's FA Cup 3rd round replay at Edgar Street in 1972 against Division One side Newcastle United. After a 2-2 draw at St James' Park, Hereford looked to be going out when Malcolm McDonald put the Magpies a goal up just eight minutes from time, but Ronnie Radford and Ricky George fought back to secure United a 2-1 victory - the biggest FA Cup shock of all time. The FA sat up, and United were duly elected to the Football League in the summer of that year. Colin Addison led United to Division Three in their first season in the league, but he soon left and his assistant John Sillett took over, taking United up yet another rung in the Football League pyramid. However, everything happened slightly too quickly and United couldn't compete with the likes of Chelsea and Wolves, and were relegated back to Division Four by the summer of 1978. Since then, United have frequently battled against relegation from the Football League, and their battle was hampered through a limited catchment area and insufficient financial resources. However, they came close to gaining promotion in both 1985 and 1996, and missed out on beating Manchester United by one goal at Edgar Street in 1990. They did, though, beat Wrexham in the Welsh Cup final that year. With automatic relegation from the Football League implemented in 1987, United clung on but the unimaginable happened in 1997 when they were relegated after a season-ending home draw with Brighton. A win would have meant relegation for the Seagulls. Conference life hasn't been too good for United after several disappointing seasons, but two FA Cup runs have taken Hereford to the third round, and also to the semi-final of the FA Trophy in 2001. The club was taken over by Graham Turner, the former Shrewsbury Town and Wolverhampton Wanderers boss, in 1998, after he had initially come to the club as Director of Football in 1995. He remains in this position, and also as chairman. 2003/04, though, was a different story. Hereford finished in second position, having won 91 points throughout the season and scored 103 goals, including a 9-0 win at Dagenham and Redbridge and two 7-1 victories, over Forest Green Rovers and Halifax Town. Nevertheless, they stumbled in the play-offs, losing on penalties to Aldershot Town after a 0-0 draw at Edgar Street and a 1-1 tie in the first leg at the Recreation Ground. Unfortunately in 2005, they failed again to be promoted to the League due to losing 2-1 on aggregate to Stevenage in the play-offs. John Trewick, the Hereford United coach has spoken to the Worcester News about tomorrow's game at Crawley. Crawley are not going to be a pushover," said Trewick. "Statistics will tell that they had among the top two best home records in the division last year. "They have drawn their first two games. The law of averages tells you that a third goalless draw is unlikely, but you never know. "Crawley have got something that they want to build on this year. But we've got to go there positive, impose ourselves and play our normal game. "We had a good away record last year and our approach will not change. We've always had a positive approach, whether we are at home or away. We want to win every game - that's how it is. "We went to Cambridge looking to win, but it did not quite happen for us. "We were denied a clear penalty after five minutes. The guy handled the ball on the line and should have been sent off. But the referee never gave it. "Not that Cambridge were any better than us. They had a little bit of fortune and they were very up for it in their first home game. It was like a cup final for them." According to Shotsweb, Terry Brown has swooped this afternoon to bolster his threadbare and injury ravaged side by adding a midfielder to the squad. Former Northampton and Kidderminster midfielder Bertrand Cozic has signed non contract terms and will be in the side to face Halifax on Saturday. The 27-year-old also had a short spell at Hereford United before the Cobblers took him to Sixfields. Cozic played three games for Hereford United after signing in March 2004. His first game was against Aldershot. Hereford United travel to the Broadfield Stadium tomorrow, home of Crawley Town, for their third Conference fixture of the season. United will be eager to put the disappointment of the defeat at Cambridge on Tuesday night behind them and get back on course with three points. The sides met at the Broadfield Stadium on the second day of the season last time round and although the outcome was a point each, United were unlucky to concede from a late free kick that hit Jonathan Gould on the back and went in after Simon Travis cleared off the line. Hereford will be wanting to go one better and take all three points this time around though. Crawley have drawn twice so far and are yet to score a goal, but manager Francis Vines has been pleased with the two clean sheets that have been kept. "I'm happy to have started the season with two clean sheets. Now we want a lot more of those, to keep making the chances and start taking them," he said, speaking to their official website. Danny Brown should be back to face the favourites after missing the tie with Dagenham & Redbridge with a foot injury. Midfielder Robbie Kember is likely to miss the game with Hereford as he is meeting a specialist about an eye problem. Defender James Donovan serves the final game of a three-match ban and is the only other player unavailable. Other than that, Vines has no other injury worries. He also hopes that now Crawley have become a full time club, the extra training will help his eight summer signings to gel in with the rest of the squad quickly. For the visitors only Jamie Pitman and Simon Travis are ruled out. However, after the defeat on Tuesday, Graham Turner may choose to change things around a bit. He will not be forced to do so though, and he may well keep the faith with the side that has started the last two games. "It's a setback it's not a disaster," said Turner, speaking to BBC H&W. "What we have got to do now is pick ourselves up at Crawley. Pay attention to what we do well and that is getting the ball down and pass it. Don't knock so many long balls and be a liitle bit tight at the back. If we do that we can come away from Crawley with three points." It is thought that under 16's can get into the game for free, as long as they enter through turnstile 9. However, it is not confirmed whether this offer is avaliable for away fans. The Bulls will hope that a good away following will spur them on to a first away victory, and help to forget the unfortunate result at Cambridge. BBC Hereford and Worcester have announced that they hope to bring commentary from Crawley tomorrow. There have been problems with the ISDN line out of Crawley in the past; assuming this works, you will get the commentary. Colleagues in the deep south assure me it is now far more reliable than previously, but I am putting this proviso in place through my own bitter experience of having flogged round the M25 in the past (for a Worcester City game) only to find the line didn't work. Assuming all is well, Herefordshire listeners will get the United game; Worcestershire frequencies will get the Harriers game from Scarborough. I will inevitably age by about twenty years in forty-five minutes trying to make sure it all works when it should... United fans should also get the commentary on the internet at www.bbc.co.uk/hereford Go to the home page and click on the "Listen Live" button. BBC Hereford and Worcester has decided to bring back Sport on Friday. The programme, which starts at 6.05pm and runs to 7.00pm, will include comment and news on Hereford United. Sports editor Trevor Owens will be the presenter. Meanwhile BBC Southern Counties Radio is not providing any live commentary of the Crawley game on Saturday. They are featuring Halifax against Aldershot. Williams played at the new Swansea stadium last night for Wales and was said to be impressed. "This stadium is fantastic," the 25-year-old told the Evening Post after making his international bow. "I've heard a few things about Swansea being interested in me and obviously I wouldn't rule out coming here. I suppose we will just have to see what happens. Williams, famous for his Cardiff City-inspired Ayatollah goal celebration at Vetch Field two seasons ago, left Yeovil for the Hammers in a £250,000 switch last winter. But he has not figured in the first team since the East London club's promotion to the Premiership, and Kenny Jackett, the Swansea manager, wants him to spruce up his midfield. "I have spoken to the manager at West Ham (Alan Pardew) and he has told me I'm in his plans," Williams added. "But I'm not involved at my club at the minute so I'm not sure what's going to happen. "I wouldn't say I'm looking to move, but obviously I'm not playing first-team football so I have to consider my future. "It's all right just staying at West Ham, but I need to be playing football so we'll wait and see." Unfortunately the free admission only applies to home supporters under 16's. Those taking up the offer should enter the ground through turnstile 9. Whether any Hereford United fans with children will go through this turnstile remains to be seen. "I think that when you go out on loan you have got to go to the right club, it is no use going to any old club - it has to be the right club for that person. Obviously as you know I was at Hereford and one thing about that club is that they try to play football. I think that it will be a great experience for Darren and I think that he will do well there. He needs to get some first team games"
"It is not the same really because obviously the three points at first team level means a lot more than three points at reserve team level. So it adds much more of a competitive edge to it"
"Hopefully I will be in the squad and they don't come much bigger than a Wales v England World Cup qualifier, you know for a Welshman playing against England at Cardiff so fingers crossed. If I am selected that would be the biggest game of my career so far"
Both Paul Parry and Gavin Williams came on as substitutes for Wales this evening. The two ex-Hereford United players saw action in the second half of the international game at the new Swansea stadium. Wales drew 0-0 with Slovenia. However the biggest cheer of the evening came when it was announced that England had lost to Denmark 4-1. Children under 16 years of age can gain free admission to the terraces for the two remaining Conference matches during the school holidays. However the match will be segreated and the newly-refurbished social club will be open to Crawley supporters only. From the M25 take the M23 southbound and exit at Junction 11. Follow the signs for Crawley town centre. At the bottom of the hill turn left of the roundabout and you will enter the football club's car park. From the south follow the A23 northbound, exiting as the road becomes the M23. Follow the signs for Crawley town centre. At the bottom of the hill turn left of the roundabout and you will enter the football club's car park. From Three Bridges Station take a taxi from the rank outside the station, approx £4.00 to £5.00 and will take 10 minutes. From Crawley Station you can either walk, take a bus or hire a taxi. To walk you need to turn left from the station. After about 300 yards turn left onto the Brighton Road and cross the railway crossing. Continue along the road for approx 1000 yards you see the stadium on your right. Use the underpass to get to the Broadfield Stadium. A bus (#10) from the bus station opposite the railway station runs every 15 minutes and costs 70p. The bus stops right outside the football stadium. A taxi from Crawley station will cost about £3.00. The motorways are expected to be very busy on Saturday. It may be sensible to allow a little extra time for the journey from Herefordshire and surrounding areas. United's recent signing Stacy Coldicott says the side must now regroup after last night's 2-1 defeat at Cambridge, with the experienced midfielder urging the squad to commit themselves fully to achieving a result in Saturday's game at Crawley. "Obviously we're all very disappointed. Although we probably haven't played as well as we could've done we still had opportunities to score quite a few goals. To get caught by a sucker-punch really, after we'd got ourselves back in the game, was disappointing." Did you think Fola Onibuje, who caused you problems in that first half, caught you by surprise? "Maybe a little bit, maybe a lot of it was self-inflicted. We didn't really get to grips with him, and we didn't really get our game going. Like you said, he was a bit of a handful, but second half I think we coped a lot better. We started the second period well - we got the equaliser - and we felt there was only one winner then. But they hit us with the second goal, and caught us a little bit cold. If we'd have carried on playing to our strengths most of the time we'd have gone on to win." You managed to close them down on the left side much tighter in the second half. Mark Angel appeared able to get a lot of crosses in from the left flank in the opening forty-five minutes? "Yes, it was a decent supply. I used to play with him at West Brom and he's got a decent left-foot on him. They looked quite dangerous at times, but like I said, we should have won a lot more of the ball than we did." The delivery from set-pieces from Alex Jeannin and Jon Brady must have given you some encouragement though? "Yes, both players have good technique. We had an opportunity first half when 'Brades' sent over a free-kick to the back stick, but we had no-one attacking it really, and a few chances went to waste. It was good to see the goal coming from a set-piece again." How exactly did the second goal come about? "I think it was a deflection. We charged down a shot and it just looped off Tony's head, and the lads just ghosted in around the back and he's stuck it through 'Maws' legs. I think some of the times you just have to say - he's taken a chance - he's had a bit of luck - it's fallen right to his feet - and he's finished it quite well." One positive from the game was the sides determination to play right to the final whistle, and Tamika had a great chance there - right at the death. "Yea, Tam's obviously disappointed he didn't get that on target, but we got ourselves into a good position. We didn't play well in the first half, but we dug ourselves out, and it's unfortunate to lose it like we did in the end. We've now got to re-group and commit ourselves on Saturday. "We've got to put it right at Crawley, and hopefully we'll be able to get a positive result down there." Graham Turner spoke to Sky after last night's game at Cambridge. "Suicidal defensive play. The first goal was ridiculous. "I don't think they had too many chances. Not caused us any problems at all apart from the odd ball that got in the box for their big lad. "Generally we defended that quite well. We defended the second ball quite well, but out of the blue we tried to run with it and got caught in possession and paid the penalty for it. "I thought we had some good situations. I thought we had some decent chances and we should not have gone in one down. And I thought when we equalised, we would go on and win it. "To be fair to Cambridge, they showed a lot of spirit, a lot of tenacity. "We didn't play as well as we can, but we still created some good situations and should have done better from them." Hereford United fell to their first defeat of the season last night away at the Abbey Stadium live on Sky TV. Cambridge United took the lead before half time and went on to win 2-1, after Guy Ipoua had netted an equaliser for the visitors. Graham Turner named, as expected, an unchanged side following the first day victory. The Us started well with John Turner forcing a save from Mawson after his strike partner, Folawiyo Onibuje, flicked on a cross. Onibuje was at the heart of most of the hosts attacks and caused endless problems for the Hereford defence with his physical presence and power. The Bulls had a good penalty claim early on when Ipoua headed Brady's cross and the ball appeared to hit a defenders arm but the referee waved away the shouts. David Bridges headed over after attacking a cross from the left with a late run while Dean Beckwith nodded Alex Jeannin's corner over. Hereford began to take a hold of the game and it was Andy Ferrell who went close after a good break from defence. Man of the match Ryan Green collected a cross field ball and swung the ball into the near post where Ferrell beat the 'keeper to the ball but his shot was off target. Adam Stansfield headed wide before Brady went as close as anyone had came. Tamika Mkandawire broke up a prolonged Cambridge spell and brought the ball out of defence, played a one-two and the delivered a cross for Brady, who volleyed towards the far post but the ball bounced inches wide. However, moments before the half time break, the hosts were in front. Tony James, for some reason known only to him, attempted to dribble the ball out of defence between two opposing players. Inevitably, he was dispossessed and The Us had fired the ball beyond Craig Mawson before you knew it. Steven Smith fired the ball in from twenty yards to make it 1-0. Ipoua attempted to level things up before the break but his shot on the turn was off target. Stacey Coldicott saw his volley held after Brady's corner was only half cleared at the start of the second half before David Chick was booked for hand ball on the edge of his own penalty area. Brady was unable to take advantage of the chance and shot wide though. Turner made his first change with Rob Purdie replacing Ferrell early on in the half and within five minutes Hereford had equalised, not before Onibuje had headed wide and Brady had fired over from twenty yards. The Bulls won a corner and on hand at the far post was Ipoua who powered a header into the bottom corner from Jeannin's deep cross. The goal spurred the Bulls on and for a while it looked as though there would only be one winner. Green played a neat ball down the flank to Ipoua, who held up play before finding Stansfield in the box. Stansfield layed it on for Green who hammered a left footed drive towards the top corner, but it was superbly kept out by Darren Behcet. He dropped the ball though and Brady was quickly on the scence to hit a rebound but Behcet completed a great double save. Beckwith picked out Jeannin on the left with a good long ball and Ipoua was unfortunate not to get on the end of the Frenchman's cross as it was turned behind by Chick. Then, against the run of play, The Us found themselves in front once again. A high ball into the box was headed away by Mkandawire but fell nicely for Turner. His volleyed shot was closed down by James, but it fell kindly to Bridges who managed to slip the ball in from a tight angle. Coldicott was replaced by Danny Carey-Bertram in attempt to change fortunes by the Hereford manager. There was more poor play by Hereford at the back and they almost gifted Cambridge a third goal. Sub Parys Okai dispossed a defender and delivered a perfect cross for Onibuje at the far post but he managed to head wide while unmarked at the far post. The Whites were given one final chance in injury time when Ipoua was felled on the edge of the box having already skinned two opponents. Brady hit the free kick off the wall and it fell to Mkandawire, but he scooped a volley over the bar from three yards. Having not built on the home success of the first day of the season will be very dissapointing for Hereford. They will be even more frustrated with the defeat as it was not really deserved. The Bulls will feel that they did enough to gain at least a draw from the game but in the end a defensive mistake has cost them dearly. There is, though, plenty of time to make up any lost ground following this 2-1 defeat in front of a gate of 2,924. HUFC Team: Mawson, James, Mkandawire, Beckwith, Jeannin, Green, Coldicott, Ferrell, Brady, Ipoua, Stansfield. Subs: Blewitt, Brown, Purdie, Stanley, Carey-Bertram. CUFC Team: Behcet, Gleeson, Peters, Duncan, Chick, Smith, Bridges, Quinton, Angel, Turner, Onibuje. Subs: Okai, Daniels, Nolan, Robbins, Duffy. Cambridge United clawed back some pride after their embarrassing opening day defeat by ten-man Forest Green with a victory against Hereford United. Roared on by a crowd of almost 3,000 despite the match being televised live on Sky, the U's got off to a slow start, but gathered momentum after Hereford squandered early chances. They got a huge boost two minutes before the break when youth team midfielder Steve Smith hammered a 20-yarder past goalkeeper Craig Mawson. And although Hereford equalized through the always dangerous Guy Ipoua just after the hour, they never looked like causing the kind of damage which brought them four second-half goals against Scarborough on Saturday. Cambridge, who were only hours away from going out of business during the summer, sent their faithful fans wild in the 70th minute when John Turner's shot was deflected to the feat of David Bridges who drove a low angled drive inside the far post. Smith's goal was also a quality strike from 20 yards, whereas Hereford's was something of a gift, Ipoua heading home from only three yards following a corner. Hereford were ruing their first-half carelessness when Jon Brady sliced the ball across the face of goal and Adam Stansfield had an effort blocked on the goal-line by centre-back Andy Duncan. It took some time for Cambridge's nerves to settle in their first match outside the Football League in front of their own fans for 35 years, but the side which contained only four survivors from the League Two line-up began to knit together well in the second half. There was an anxious end for them however as Hereford were awarded a free-kick on the edge of the box in stoppage time. Brady blasted the ball in and the rebound fell to Tamika Mkandawire, who could only scoop it over the crossbar from close range. Difficult evening for team and supporters. Hereford United will bounce back from the defeat at Cambridge last night, but will need to give some thought as to why the defence let in two goals. Those supporters at the game were dismayed to see Tony James lose the ball when attempting to dribble forward, which resulted in Cambridge's first goal. The second goal appeared to come off a defender into the path of a Cambridge forward. Those watching on Sky would have had a better view of this goal than the 261 Bulls' fans who were at the far end of the ground. At least we were lucky to see the game. Some Hereford United supporters caught up in the travel problems in Worcestershire failed to reach the ground. With an accident on the M5 and one on the M42, many were caught up in the jams. There was a fatality in both accidents. Luckily we were alerted by the travel news on BBC Hereford and Worcester that there were problems ahead and so took the Stratford route out of Worcester. Although this route was very slow we arrived at the ground in good time. Had it not been for H@W, we could have been stuck for sometime. Before entering the ground, we had to walk over a cattle grid and through a small field which had been grazed by cattle. They had left their mark all over the path. Cambridge United claim that their bacon rolls have won an award, so having entered the ground, several were purchased. They were awful. It appears that the bacon pre-cooked before reaching the ground. Perhaps it was left over from last season. They did give us a refund. After Saturday's four goals, fans were looking for a repeat. And when the messeage came through that Stevenage's Maamria had been sent off, spirits rose. The first half was a well contested affair and when Cambridge took the lead, the feeling was that the Bulls would bounce back. They did but it wasn't enough. The journey back was less eventful, until motorway signs showed the M5 still shut. Luckily the signs were incorrect. Cambridge sealed their first victory of the season with a 2-1 win over Hereford. The Bulls found theirselves one down at the break after Steven Smith hit a curling shot past Craig Mawson. In the second half Hereford grew in confidence and got the equaliser through Guy Ipoua, who rose at the back post to header home a corner. However, it was the youthful Cambridge who got the winner as David Bridges followed up a shot that had deflected off a Hereford defender. Hereford United travel to the Abbey Stadium this evening for their first away fixture of the Conference season against Cambridge United, just relegated from the Football League. Kick off is at 8.05 p.m. because the game is being screened live on Sky Sports. The U's found out that life in the Conference could be difficult as they suffered a 1-0 defeat at the hands of lowly Forest Green Rovers, who had been reduced to ten men. Cambridge will be wanting to put it a big performance after the opening day disappointment, especially in front of their home fans for the first time this season and with the game being live on Sky. Rob Newman has to make one forced change to the side he named against FGR because eighteen year old defender Adam Davies is involved in the Wales under 21 international fixture. New signing Rob Duffy may feature instead. The two sides haven't met since January 1997, when The Bulls defeated their opponents 1-0 at Abbey Road. However earlier that season Cambridge came to Edagr Street and won by the same margin. Graham Turner has no fresh injury worries following the impressive first day victory over Scarborough. Jamie Pitman and Simon Travis remain the only players on the sidelines and it will be a few weeks before either return. It is thought that Turner will keep the faith with the side that started on Saturday. Following the excellent display on Saturday, The Bulls will be intending to continue in the same vein of form and take all three points from Cambridge, who will also be aiming to put right the wrongs from the showing at The Lawn. It would be dissapointing to say the least if Hereford did not take anything from the game, having given themselves a great base to start from with the demolision of The Seadogs. Should be a good atmosphere at Cambridge. Cambridge United are pulling all the stops out for the visit of Hereford United to the Abbey Stadium tomorrow evening. With the special offer of free entrance for children under 16, provided they are with an adult, and pre-match entertainment, the evening should be a colourful event. Tomorrow evening Cambridge United is bringing the flavour of Sun, Music and Football to the Abbey Stadium and their home match against Hereford. Arco Iris (Portuguese for rainbow) was first formed in 1992 by the local council to provide a means to involve the community in Samba music. They were originally led by Dave Willets, the Music Director of the London School of Samba - to whom the band owes a lot. They have since grown and developed into a fun, talented and successful community group, with a particular remit to involve the community in what they do. They play numerous gigs in the local area, and occasionaly run local workshops for community groups and charities. This summers successful gigs have included playing at the Windmill special school in Fulbourn, A Brazilian festival in Paris, the Drogheda Samba festival in Ireland (so a bit of international renown) The Junction in Cambridge, The St Ives festival, various college balls and Strawberry fair. 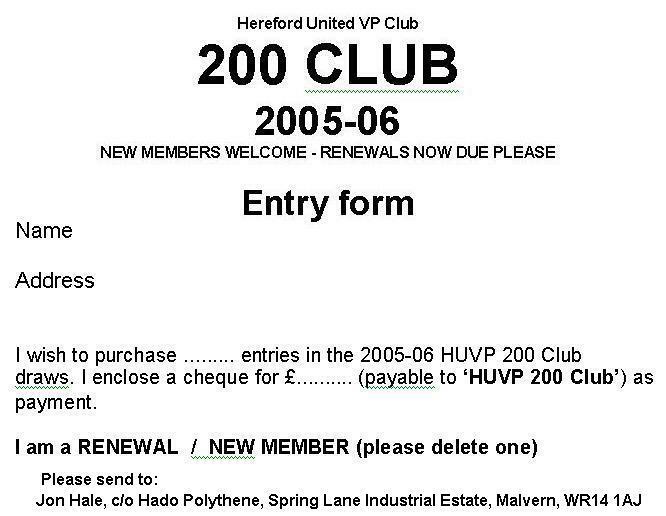 Since its re-launch in 2003 the Hereford United 'VP 200 Club' has donated over £2500 profit directly to the football club. Having re-established the competition (it was run for many years in the 80s and early 90s) the number of people entering is pushing up to 100, and it is hoped more people will enter this season. Entry is £24 - and you will automatically be entered into 10 draws (August to May) where the prize money is: 1st - £50, 2nd - £25 and third £10 every month. Better still, every May a 'Superdraw' takes place when one lucky entrant will win £500 - Mr D Badham of Hereford the lucky recipient in May of this year. The '200 Club' is open to every supporter of the football club, not just members or associates of the VP Club. Draws take place after the last home game of each month in the VP Club and results will be announced on the club web site forum and in local press. Prize money will be sent automatically, you do not have to claim. Open to anyone over the age of 16. If you are interested please email me jon.hale@tiscali.co.uk and I will send you an entry form. 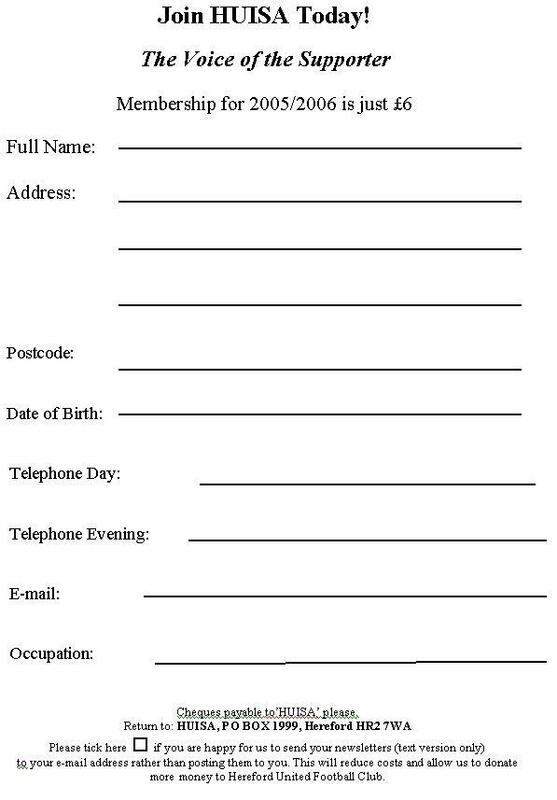 Closing date for entries is the 30th September 2005. New loan signing Darren Blewitt is expected to play some part in tomorrow's game at Cambridge United. Blewitt was named on the bench for Hereford United last Saturday, but was not required. Blewitt was said by the official Hereford United website to have signed for the Bulls on a season long loan deal, but there is some doubt whether that is strictly correct. Sources have told Bulls News that the deal may only be until January when it will be reviewed. Blewitt is said to want first team action and was wary of agreeing to committ himself for the whole season. Blewitt comes to Edgar Street with somewhat of a reputation as a strong tackler. It has even been suggested that Teddy Sheringham at West Ham asked for him not to train with the first team as he had been on the receiving end of Blewitt' tackles. He was interviewed recently by the West Ham United fanzine Ironworks Gazette after his loan spell at Southend was over. Asked about any future loan move Blewitt replied: "I would tell the manager concerned what I want to get out of my loan which is to actually play first team football and then I would listen to what that manager had to say to me." He was asked about his discipline. "You know a couple of years ago I was getting what ten? Twenty yellow cards a year?" But last season was better? "I think that I had two yellows but then I got booked in four games in a row. So I think that I ended up with about six cards all season, six or seven yellows which is good for me." And you weren't sent off last season? "I think that it is, yes it is definitely the first season I can ever remember at any level where I haven't been sent off, but I still cannot understand how it happened. You know in some of the games I played in I was definitely near the mark but I think that the referees are getting to know me and they speak to me a lot more. When I was on the bench for Southend and was doing warm ups, a referee came and spoke with me whilst I trying to warm up. The referee who was in charge for a Southend first team game had been in charge at a few West Ham reserve team games. He just came up to me and said "Alright Blewitt?" so a few of them are getting to know me now so it was good. "My temperament is something that I have had to work on both on and off the pitch, I do feel a lot calmer but if I hadn't got my act together I wouldn't still be here would I? I've still got a bit of an aggressive edge to my game, you cant lose it completely because you would lose the player. When I am playing I will never shy away from a tackle and I will always be shouting, that will never change. I will always be geeing the boys up because that is the way that I am on the pitch. Off the pitch I have changed a lot as well." Wigan played Chelsea this afternoon in their first game in the Premiership. Although they lost to a cruel injury time goal, Wigan can be proud of reaching the highest level in English football. It all started back in 1978 when Wigan Athletic was elected to the Football League. Wigan's first game was against Hereford United on August 19th at Hereford's Edgar Street ground in front of 5,674 with approx 3,000 'Latic' fans making the journey to witness a 0-0 draw and Wigan's first ever point in the Football League hierarchy. How times change. To bring 3,000 fans to Edgar Street for a League match in these days would never happen. Even when the Bulls play Kidderminster at home next March it is unlikely that anything like 3,000 will be in the away end. However on a happier note, more Hereford fans were at yesterday's game than in 1978. Some 3105 watched the game with just over 100 from Scarborough. Only 2674 watched that game with Wigan. According to Bullseye there are still several players without sponsorship in the Hereford United squad. Wayne Brown, Stacy Coldicott, Graham Evans, Andrew Ferrell, and Andy Williams. In addition both Tony Ford, the fitness coach, and Bernard Day, the goalkeeping coach, are being offered for sponsorship this season. It is beleived that the club decided to extend the list of those available after Bulls News contacted the club about sponsoring Wayne Jones, the Hereford physiotherapist. Bulls News felt it wasn't right to sponsor a player or coach as there was a possibility that this could compromise its independence to report objectively. The move could increase the income for Hereford United from sponsorship by £750. Jimmy Quinn, the former Shrewsbury Town manager, is backing Stevenage to win the Conference title, and took a swipe at Graham Turner being both chairman and manager at Edgar Street in this mornings NLP. "I'm going to stick my neck out and back Stevenage Borough for the title," said Quinn who then said that strikers Elding and Maamria are the key. "Hereford, as ever, will be knocking on the door, but there are a lot of teams who have a shout. "Hereford will probably be favourites and Graham Turner's teams always play good football. But with him being chairman as well as manager, he has to be careful he gets his budget right and that footballing matters don't get in the way of that. "Certainly, his side played the most entertaining football last year and were a joy to watch. Their key player is Adam Stansfield and, if he's on form, they should do well." Meanwhile the NLP reports that Terry Fearns may move from Southport. The striker who bagged 41 goals for his side last season is said to be wanted by Mark Wright at Peterborough. Fearns scored against Hereford United in the FA Cup last season. Keith Hall is to report on Hereford United this season for BBC Hereford and Worcester. Last years' match day reporter Peter McMillan has moved to cover Worcester. Hall was at Edgar Street yesterday for the first Conference game of the season and will be at Cambridge on Tuesday evening. He recently took a course in radio work to further his career and has worked for Conference TV. Details still are awaited of what coverage Conference TV are doing this season. 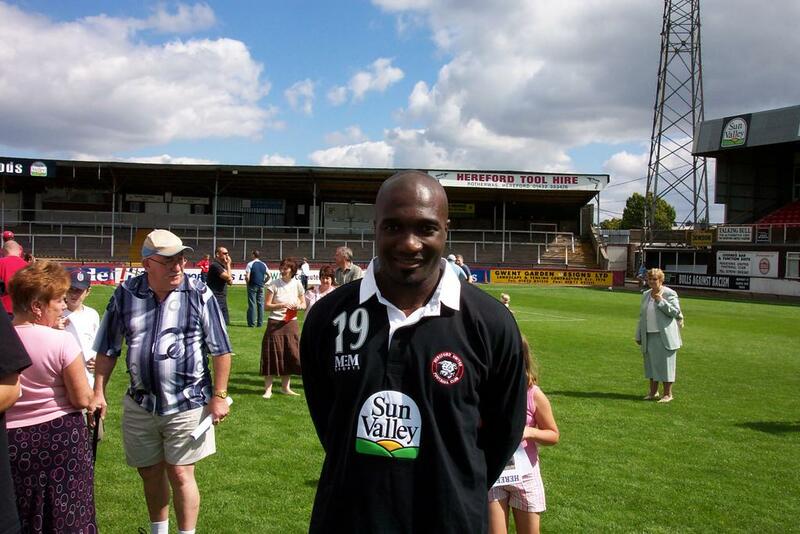 Hall is well-known to, and respected by, Hereford United and its supporters. He has worked as an announcer at the club for some years. "It was a good start to the season," Graham Turner, the Hereford United manager, told the Non-League Paper after yesterday's 4-0 defeat of Scarborough. "I never thought it was going to be easy against them and that looked to be how it was going in the first half. "But we have to be delighted with the three points, the four goals and the manner it was achieved. It was exciting stuff in the second half. "We had to grind it out in the first half but I always thought we looked as if we were going to score. "We controlled the game for long periods and we controlled it when they had the ball so that when we had to defend we were always going to be comfortable and had a nice shape. "If that's the promise of things to come then we could be in for a good season." Nick Henry, the Scarborough manager, told BBC Radio York that Hereford were a very strong side this afternoon. "After we conceded the first goal, we seemed to collapse. I always think when you're two nil down you may as well lose three nil. "Leigh Walker did ever so well. He made three or four fanastic saves, but I'm very disappointed with the last half hour. "Ipoua was the difference between the two sides. He was very lively and very strong. We've played against him a few times. He looked a totally transformed player today. "When players leave clubs and go to a different club, it gives them a spar and a new lease of life and he seems to have got that." John Trewick told BBC Hereford and Worcester that today's win was a great result. "We had to be a little patience in the first half. We hit the post, had a really good chance which we missed. So it looked as though we were going to have to work really hard to get opportunities. But we kept plugging away and we got our reward," said the Hereford United coach. "In the end we won by four, hit the woodwork a couple of times and had another couple of situations when we might have scored. "But we must not get carried away, it's the first game of the season." Talking about Guy Ipoua, Trewick said he's a well travelled player. "It's a great opportunity for Guy, even though he has come out of the league, to reignite his last three, four or five years of his career. "He can score goals. he's got a good touch. He turns very, very well with the ball. He's got a lot of assetts. Hopefully we'll be good for each other. Relecting on the mid-field Trewick said Ferrell and Coldicott are two tough cookies. "Stacy has got a lot of experience. He puts messages around on the field, gets people in the right areas, drives people through. "Andy is very, very busy. He gets around the field, tackles people. He heads it, gets forward. "They have both got a lot to offer us. You play against those two over ninety minutes and you'll know you've been in a game." Scarborough enjoyed the opening spell with some prolonged possession although it was the hosts who threatened first when Jeannin's dangerous cross from the left was headed behind. Clear cut chances were hard to come by in this tough opening half, which saw two very determined teams foil each others attacks. It was United who almost took the lead midway through the half after some good build up play. Ferrell played the ball into Ipoua who, with his back to his marker, flicked the ball around the defender, and sprinted through on goal. The Cameroonian did everything right and fired beyond the reach of Leigh Walker in the Boro goal, but was denied by the near post. Ryan Green had a good opportunity when his run into the box from the right was picked out with a good pass, but he took an extra touch forcing him wide. The Welshman managed to cut the ball back across goal where Adam Stansfield attempted to force the ball over the line but the danger was cleared. Scarborough's first chance did not come until just in the second half, but they will look back on this missed opportunity and perhaps mark that as a changing point in the game. Jeannin mis-judged a left wing delivery, allowing it to go over his head and Ashley Lyth was behind him to direct a header goalwards. Craig Mawson came to Jeannin's rescue and plucked the ball out of the air to keep the scoreline level. Ipoua, whose power and pace caused problems for the Seadog's defence all afternoon, hit a Green cross against the cross bar, triggering a goalmouth scramble where Stansfield also had a good chance to net. Then, United were incensed as they were denied what appeared to be a fairly clear cut penalty. Jeannin went to head a cross at the far post, and in doing so was caught on the head by a flying Scarborough foot. The referee, though, amazingly ignored the claims and allowed play to continue, even though Jeannin was on the floor with a head injury. Finally though, The Bulls did get their breakthrough and it was a debutant who opened his Hereford account. Jeannin took a corner from the right and up leapt Beckwith at the near post to glance a header towards goals. It flew beyond Walker and hit the underside of the bar before bouncing into the gaping net in front of a packed Meadow End. From then on it was all one way traffic as the floodgates opened and the Bulls did not hesistate in taking full advantage. Other than a one off attack for the visitors, in which Mawson did well to come out and deny Mark Quayle, The Bulls dominated fully and played some fantastic football much to the delight of the Edgar Street crowd of 3105. Hereford's second goal followed five minutes later when Green knocked the ball back to Brady on the right flank and he swung in an inch perfect cross to Ipoua. Ipoua held off the challenge from his marker and met the ball with a diving header, sending the ball underneath the diving goalkeeper. Rob Purdie was introduced in Brady's place, he had been booked, with fifthteen minutes remaining and Carey-Bertram replaced Stansfield on eighty three minutes, two minutes before the Bulls made it three. The Bulls broke quickly after a Boro corner through Green. He raced forward before releasing a pass to Ipoua, but his shot was pushed away. Luckily though, it fell right into the path of Green, who'd continued his run, and he hammered the ball into the back of an empty net. Ipoua received a standing ovation as he left the field of play, and Craig Stanley took his place. In the final minute the rout was completed in a move that involved all three of the substitutes. Rob Purdie burst forward before sliding a pass into the path of Stanley's run, just in the penalty box, but his low show was pushed away by Walker, but Carey-Bertram was on hand to fire home to make it 4-0 to the Bulls. There were many happy faces seen leaving Edgar Street this afternoon, having witnessed what was a very good opening day of the season for United. The team was organised in defence and looked full of ideas going forward. After a tough first half, Hereford broke down their opponents and went on to demolish them, sending out a stern message to the rest of the Conference. They will be eager to follow this result up though, when they make the trip to Cambridge United on Tuesday night, in front of Sky TV cameras. HUFC: Mawson, James, Mkandawire, Beckwith, Green, Jeannin, Coldicott, Ferrell, Brady, Stansfield, Ipoua. Subs: Blewitt, Brown, Purdie, Stanley, Carey-Bertram. SFC: Walker, Elebert, Weaver, Baker, Lyth, Bishop, Hackworth, Clark, Nicholson, Quayle, Wake. Subs: Foot, Pecora Redfearn, Eccles, Palmer.